Yvonne is a registered nurse by trade, but only works a few days a year at a clinic in Huron now. It started with her taking summers off from nursing to run a baler and has progressed into running rakes, balers, driving truck, running a grain cart-whatever Mike can talk her into! She also is the book keeper and office manager of the operation. Mike grew up helping and working alongside his father, Walter, with alfalfa and hay. At the end of a long day of hand stacking small square bales in railroad box cars, Mike said, “Dad, the last thing I will do when I grow up is be in the hay business! !” After the death of his father in 1986, Mike went full time into raising alfalfa, starting in 1986 with 245 acres. The farm has now grown to over 8500 acres with twelve full and part time employees. We raise alfalfa, corn, soybeans and occasionally some wheat. Our oldest daughter, Jackie, married her high school sweetheart, Derik Kleinsasser, in 2005.They both graduated from South Dakota State University in Brookings, Derik as a teacher and Jackie as a registered nurse.They moved to Minneapolis, MN and worked several years, then started a family.Addison was born in June 2009.In March 2010, Derik and Jackie moved back to Huron and started farming with us.What a blessing it has been to have them working with us! Derik has taken on more responsibility every year, which is a huge help.He manages much of the grain side of our operation.In fact, if you ask Mike how the bin system works he may not be able to answer that quite accurately, but Derik would. In November 2012, they had another baby girl, Stella.Both girls love riding in tractors and combines.They have been living at the farm for a year now, and have started a collection of animals-2 goats, 4 cats, 2 dogs and they raised 2 bottle calves and they love every minute of it.Jackie is also employed in the emergency department at Huron Regional Medical Center as an RN and is a consultant for Rodan and Fields. Laura, our youngest, attended the University of Minnesota and graduated with a biology degree in 2011. While at the U of M, Laura met Jon Fuehrer at a Campus Crusade event. They were married in June of 2011. Laura was accepted into the Physician Assistant Program at Wake Forest University in Winston Salem, NC. They relocated to NC and Laura began the longest 2 years of her life-according to her! She graduated from Wake with her Physician Assistant degree. Jon graduated with a Bachelor’s degree in Mechanical Engineering from the U of M. While in NC, he worked as a mechanical engineer and also graduated from Duke University with a Master’s Degree in Engineering Management. After their graduations, they moved back to Minneapolis. Jon works at Flint Hills Resources as a project manager. 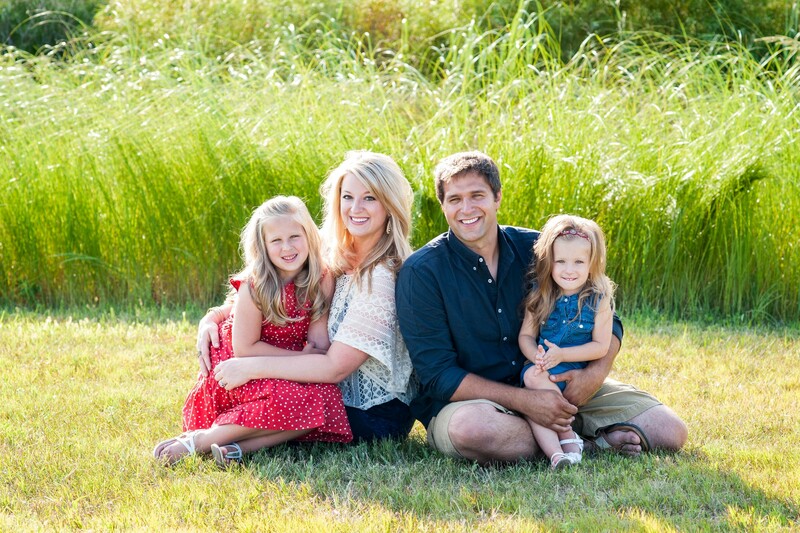 Laura is working for Surgical Consultants, a general surgery practice in Edina, MN. No children yet, but they do have a cute little dog named Phoebe! Since early on, Jackie and Laura worked on the farm cutting, raking and baling alfalfa and driving truck in the field. They continued to help through college. Now Jackie has come full circle and is right back in the middle of it. Laura still enjoys coming home and getting into a piece of equipment. She had her first lesson in the combine this fall!